I’m doing the marathon. I’m not doing the marathon. I’m doing the marathon. I’m not doing the marathon. This has been one of the most flip flop decisions of my life and now it’s been taken out of my hands, I’m heartbroken. I had a cold when I was in Italy 2 weeks ago. I felt like I was over it when I came back so I did a 19 mile run. Apparently this just annoyed my cold which came raging back and turned into a fully fledged sinus infection, bringing all its friends – headache, toothache, coughs, rattly chest. I’ve been living on cold and flu remedies and getting no sleep. I haven’t run for a week and a half so the decision is in. I’m not running the marathon. I think a little part of me believed I would all the way through this year’s training programme. Now I’m definitely not, I’m ticked off. I’m embarrassed to tell people too, it feels a bit pathetic. I ran my first Great North Run in 2006. It was my first half marathon and took me 2 hours and 45 minutes. Since then, I’ve run every single one expect for 2012 which was the husband’s 40th birthday. I’ve got my half marathon time down to 2 hours 15 although recently it’s stuck at around the 2 hours 20/25 mark. I absolutely love the Great North Run. It’s amazingly well organised, the atmosphere and the spectators are fantastic and I get a lump in my throat every time the Red Arrows go over. I run with a good friend and we travel to Newcastle on the train together then she waits for me at the end and we go home. This year we said would be our last GNR. It’s getting expensive and to someone who trains in flat York the whole course feels like it’s uphill. But I might have changed my mind on the finish line…we’ll see! This year was astonishingly hot for September in the grim North East of England. I knew as soon as I set off I would struggle with the heat so put any thoughts of a PB out the window and focused on enjoying the run. There are bands every mile, people in costumes and of course Bus Stop Elvis as mile 11 – love him! Maybe I just wasn’t in a competitive mood but I felt like I’d had a nice day out. I finished in 2 hours 28 and I’ll take that – anything over 2 hours 30 and I’ve have been gutted. I wasn’t the millionth finisher (it looks like she was about an hour after me) but congratulations to her – and to GNR for being such an amazing event. This year I’m training for my second marathon and the husband is training for his first one. I got into the habit of taking gels with me on longer runs last year, but when I went to the cupboard this year it was pretty much bare. Apart from one gel that expired in March this year, but I had it anyway. I’m not dead yet. Last year I used SiS Go Gels which were pretty good. They weren’t the gels given out on the York Marathon route so I set off with 5 of them tucked in my belt like the world’s worst cowboy. The husband also needs to start thinking about nutrition as he’s starting to flag on the longer runs, he doesn’t even take water normally let alone any food or gels. 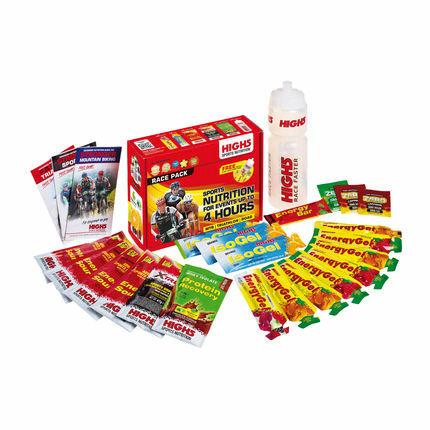 I went to the site we normally use and found the High5 Race Pack. What a great idea. It’s cheap and has a stack of different gels, tablets and shakes to try. There are different flavours, some have caffeine some don’t…perfect if you’re new to fuel on the go and need to try things out. I’ve tried the tablets to add to water and they’re great. They’re zero calorie so I’m not entirely sure what they’re made of but they add a bit of salt and flavour which seems to help convince my body it’s not about to keel over. I’ve tried one of the caffeinated gels but I’m not so sure about that, it gave me a massive headache while running. Maybe I’ll try one more and see before I decide I definitely don’t like them. My fuel strategy for this year will be similar to last year I think, some gels and some flapjack for on the route as well. I might add some of the water tablets and some caffeine but I’ll see how they perform in training. I definitely don’t want anything new to upset my stomach on the day! Training this week – not bad. I’m up to half marathon distance now and have a 17 miler planned in for this weekend. Happy running!